The interview is just as important points wise as the other judging stages of the contest. These are not easy subjects for any contestant to give a reasoned point of view in a short interview. You are advised to read the most recent headlines. EXAMPLE 1. - climate change was denied by hundreds of politicians and corporations in the quest for profits. Only recently has President Obama and the United Nations admitted the importance of taking action. EXAMPLE 2. - Ocean plastic is choking wildlife, but it took 30 years for the subject to reach the headlines. Scientists now realise that this is one reason that fish stocks are at an all time low. They also made the link with toxins attached to the plastic that fish ingest and the food we eat. EXAMPLE 3. - Home ownership is no longer viable for the young where nobody is building affordable houses - effectively enslaving this and the next generation of young families. This is a major failing on the part of any administration that has failed to plan ahead. EXAMPLE - Subservience for women is a way of life in many developing countries. Women are treated like property. They are second class citizens without a voice, or a vote and they are exploited and yet we have women in high office from Africa and Asia. EXAMPLE - And finally, attitudes need to change if we are to create a truly sustainable society based on a Circular Economy. A Circular Economy is one that may continue. An example of an issue that cannot continue with serious social unrest, is Inflation and Economic Growth. Economies must be based on what mother earth can comfortably support - naturally. Not super-heated economies reliant on fossil fuels and continued increases in output for short-term stock market profits. WOW - That's a whole lot of rotten eggs in several moldy baskets. TIP: Pick the subject(s) that interest you most. Those are the ones that you will be able to speak on best. Nobody is expected to know about all of these topics, or be an expert on even one of them. Keep it light, but be prepared to back up any views that you state at a conversational level, should a judge ask for more. HELP SAVE OUR OCEANS - As an ambassador for the high seas, the Miss Ocean contest sends a message to all women around the world that they care about pollution, acid oceans and climate change. Empowered women do this in a way that will influence both world leaders and inform the ordinary man in the street. 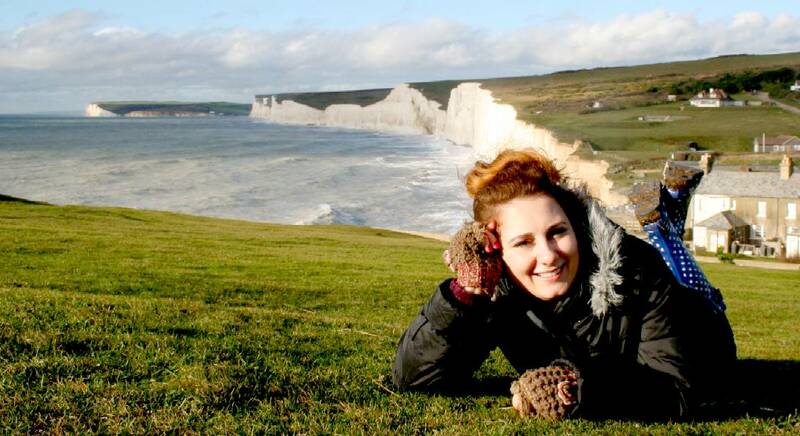 Monika is seen here in winter, enjoying the sunshine reflected on the famous Seven Sisters cliffs at Eastbourne in Sussex. This beach is also a useful (and unusual) surfing location. This webpage is copyright Cleaner Oceans Club July 2015. The name Miss Ocean™ is a trade mark of the Cleaner Oceans Club™. The blue bird in flight logo is a trademark of BMS Ltd, used under Licence. The color blue is a protected element of the marks.